Kiran Devi's children were among thirteen kids killed when their van crashed into a speeding train at an unmanned railway crossing. 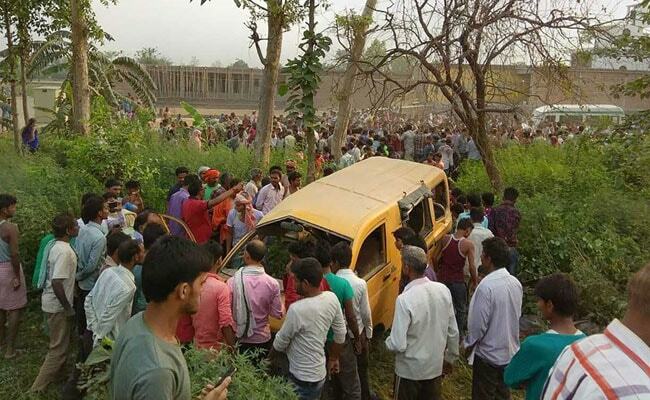 13 children were killed after a train collided with a school van in Uttar Pradesh on Thursday. Mishrouli: Kiran Devi, the head of this village in Kushinagar district, is inconsolable. Her three children - Ravi, 12, Santosh, 10 and Ragini, 7 - were reluctant to go to school today morning. They boarded their school van, but only to leave her forever. Ms Devi's children were among thirteen kids killed when their van crashed into a speeding train at an unmanned railway crossing. At her residence, Ms Devi is crying continuously while her husband Amarjeet sits still, numbed by the terrible shock. The photographs of my two grandsons and granddaughter are still hanging on the wall of our house, but the family will never be able to see them, said Harihar Prasad, the grandfather of the children, uttering each word with great difficulty. "They were not ready to go to school. And today, they have left us forever. My son will never be able to father any children, as he has undergone a family planning operation. Everything has been lost for us," Mr Prasad lamented. The people of the village too were in a state of shock and trying to console the family. "The children were good in studies and they used to play a lot," Raja Gautam, a villager, said. Hariom, a student of LKG, and resident of Batrouli village also died in the accident. He was the only son of Amar Singh, a farmer. Both, the mother and father were unable to speak, but villagers said that the boy was very lovable and passionate about cricket.